NYC, 02/21/2019, 4:00PM. 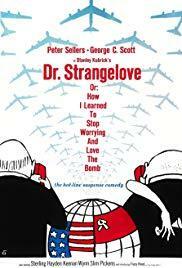 Stanley Kubrick's Dr. Strangelove or: How I Learned to Stop Worrying and Love the Bomb (1964): Scathing Black Comedy with Peter Sellers, George C. Scott. 95 min. In 1989, the United States Library of Congress included Dr. Strangelove in the first group of films selected for preservation in the National Film Registry. It was listed as number three on AFI's 100 Years...100 Laughs list. Production took place in the United Kingdom. Story is loosely based on Peter George's thriller novel Red Alert (1958). The film recieved four Oscar nominations at the 37th Academy Awards.